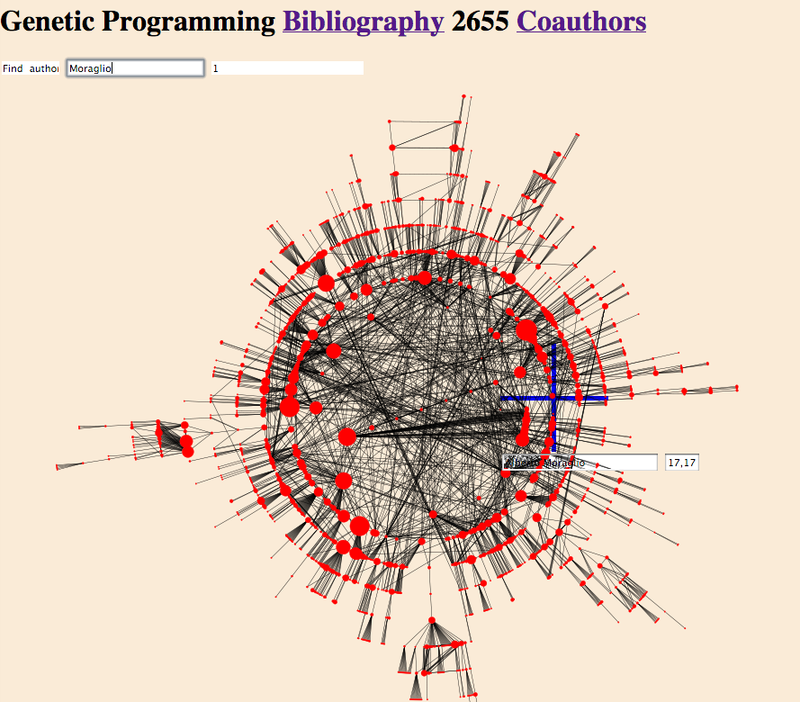 When the cursor is moved across one of the coauthorship graphs your browser may display a "tool tip" as it passes over each author node. It is left pretty much up to the browser how (if at all) it does this. Firefox can display a small yellow box (e.g. ) as it passes over the red node for a genetic programming person. Firefox also displays a URL for each red dot (node in the collaboration small world network). Like the tool tip, the URL includes the author's name and the number of entries they have in the GP bibliography. Also the blue cross hairs (created by the search function) also give author names (and their co-authors, and their co-co-authors, etc., etc.). The text field next to "Find authors" works on each key stroke. This means as you type more of a GP person's name, the number of people that matches reduces as you enter each letter. However with some browsers (e.g. Firefox) if you paste a complete name into the field this does not count as a keystroke and nothing happens, until you tell the input field you have finished with it. E.g. by tabbing to the next field or clicking the mouse elsewhere in the page. Alternatively manually enter a character after the paste operation. E.g. add a space after the person's name. The problem is now cured but in case the work around is useful in other circumstances, I am leaving the following text. /Applications/Google\ Chrome.app/Contents/MacOS/Google\ Chrome --js-flags="--stack-size 2048"
My thanks to Kiran Lakhotia for diagnosing the problem and providing this workaround. WBL 23 Nov 2012 (last update 14 Sep 2016).